Grower’s Choice has introduced the new Digital 315w Ceramic Metal Halide Complete Fixture. Utilizing 50/60-Hz low frequency square-wave technology, the fixture can maintain lumen output higher than 90% at over 10,000 hours while maintaining the initial spectrum, ensuring both reliability and efficiency. The fixture is capable of operating at 120V to 240V and 277V, making it ideal for home and commercial applications. The Smart-Dim technology allows growers to dim and super-charge the lamp depending on the grower’s specific needs. 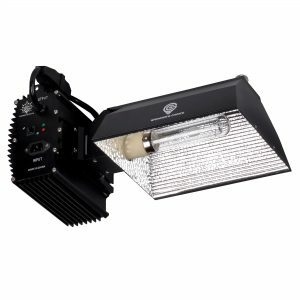 Grower’s Choice offers the broadest range of 315w lamps, including the 3100K Full Phase, 3100K-R Red Enhanced, 4200K Day Light, and 10,000K Finishing. For more information, stop by your local gardening store or visit Growersc.com.